An amazing ambience overlooking the Sea of Cortes while enjoying delicious, creatively crafted seafood dishes with fresh and healthy ingredients in mind. Their specialty is fresh seafood from the Baja waters prepared in different and creative ways. The Bahia Hotel’s signature restaurant is known for its vibrant atmosphere, delicious menu and live music. The menu blends Mediterranean cuisine with Mexican influences and chef Rogelio and his team work with fresh, high-quality ingredients in order to let their flavors shine. Bar Esquina is proud to use organic ingredients from local farms, USDA´s Choice and Prime meats, as well as fresh seafood from the Pacific and Sea of Cortes. Chamuyo Restaurant (an outdoor Argentine Grill) is located in the heart of Cabo San Lucas, where you will feel wrapped in a relaxed and casual softly lighted atmosphere, of a typical Argentine neighborhood. Overlooking the Sea of Cortes located in the very upscale Esperanza Resort. It is known for its exquisite variety of fresh fish and seafood specialties. It utilizes only the freshest possible ingredients, offering a spectacular and unusual presentation. Inspired by the wide selection of food that the coasts of the American continent offers and the international experience of the “Cocina del Mar” culinary team. Edith’s is a wonderful combination of the cuisine of Baja California with a Guerreran flair, featuring a regional fusion of steaks and seafood with local fresh ingredients. A lovely outdoor organic restaurant in the foothills of the Sierra de la Laguna Mountains in San Jose and is surrounded by their 10-acre organic Flora Farm. Charming experience and excellent organic dishes. Beautiful view of the Cabo San Lucas Bay and Land’s End located in the Cabo Hacienda Beach Club and Residence on Medano Beach. Hacienda’s menu showcases the different regions and flavors of Mexico through expertly crafted authentic dishes using on the finest local ingredients. An Argentine steakhouse located in the heart of Cabo San Lucas which specializes in excellent grilled meats with delicious accompaniments. For an extra special treat try their Parillada for 2 or more guests which includes ribs, flank steak, sausage and a great bottle of wine. 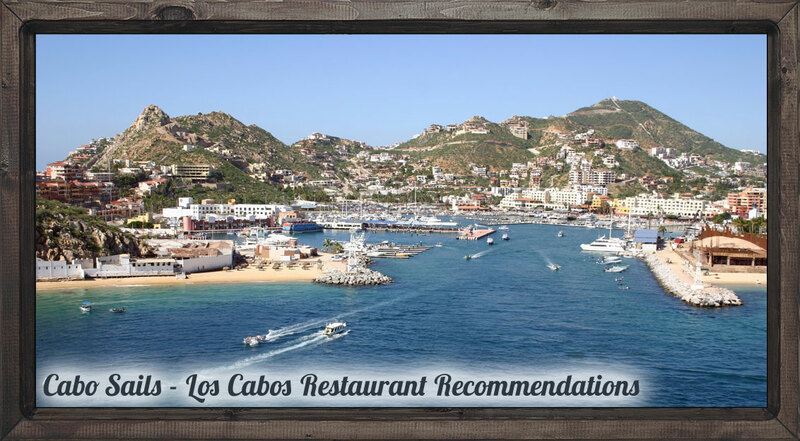 Charming, casual and unpretentious downtown Cabo gem which offers excellent authentic Mexican cuisine. Everything on the menu is delicious particularly the mole dishes. Enjoy breakfast, lunch or dinner Cabo-style with your toes in the sand. The 16-ounce Office Margaritas are almost as famous as its traditional Mexican kitchen and fresh local fish and seafood. On Sunday and Thursday evenings there is always a lively Mexican Fiesta with pre-Hispanic and traditional folk dances, piñatas, tequila shooters on the house, waiters’ show, and audience participation, with dancing under the stars until 11 pm. A protégé of the late 3-Michelin-star-chef Jean-Louis Palladin, Dahrouch’s travels throughout Mexico in search of regional flavors have enabled him to provide One & Only Palmilla guests with unique dishes that are authentically Mexican. The open kitchen allows guests to observe his team’s techniques, whilst the restaurant’s wine cellar contains the world’s largest selection of Mexican wines, as well as wines from around the world. Agua by Larbi also offers guests a wealth of beverage options from the dedicated tequila and mezcal trolley, which introduces the distinctive Mexican spirits, from the blanco, reposado and anejo varieties of tequila to the unique and lesser-known mezcal. Tucked into the cliffs of The Resort at Pedregal and stocked daily with bounty from local fishermen. El Farallon has become a hallmark of exquisite dining at the luxury resort. Located in the luxurious Las Ventanas Resort acclaimed locally sourced, nationally inspired menu is rooted in authenticity and all things local. Under the helm of Executive Chef Fabrice Guisset and Executive Sous Chef Gustavo Pinet the menu at The Restaurant reveals a deep respect and admiration for Mexico’s culinary traditions, with ingredients and techniques rooted in the country’s long history, geography and customs. Inspired by our team members’ most-cherished culinary secrets and family recipes, the menu features unique dishes and flavors that will bring you on a culinary journey through the many regions of Mexico.